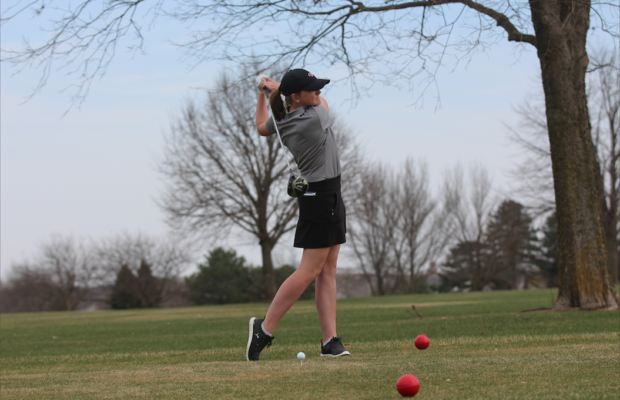 While snow sprinkled and covered Pheasant Ridge Golf Course in early April, the women’s golf team made sure it was one step ahead of every team in its conference. Practicing on mats and in sheds on the course, the team stepped onto grass to play only a couple times before their first meet. “Coach Younkent would meet up with us before practice and ask, ‘Do you girls still want to have practice because of the snow,’ and we always said, ‘For sure,’” senior Clare Rolinger said. “It was kind of difficult when there was snow. Putting is a big part of the game, and shooting off the green, so without that, it was hard, but we had really good resources and used them well,” freshman Amara Lytle said. With the women’s golf state competition approaching on May 29-30, the CFHS team is determined to meet their goal to compete in the state tournament this season. Four out of six varsity team members graduated from the 2017 state champion golf season last year, and the team had to make strides in order to compensate for who they lost. Even with a loss of players, many underclassman like Lytle, who shot an 86 and tied for 7th place at the Mississippi Valley Conference Supermeet has stepped up into one of the four open varsity spots.“I am really excited that everyone has gotten along really well during this season. We have been a really cohesive team at this point,” Lytle said. The women’s golf team’s season is right on course, said head coach Megan Youngkent. “This season has gone exactly how we thought it would go, but better than other people did. I think when we lost our four studs last year, people thought it was going to be a rebuilding year, but I think we all have different plans than that,” she said. The team competed at the supermeet located in Cedar Rapids at Gardner golf course and ended in fourth place, losing by one stroke at a final score of 365 to Dubuque Senior, who took third place. “We talk a lot about that every putt is important because things can come down to one stroke, and it did,” Youngkent said. “We didn’t definitely play our best at the supermeet, but we definitely did not play our poorest, which is exactly where I want to be right now because I want them to be playing well but see where they need to have their greatest work and that they need to keep improving.” she said. Senior Clare Rolinger, also one of the leaders on the team, has seen the growth of their hard work at their competitions. “We did a lot better at the supermeet than our last one, and that is good because at the last one we got fifth place, and at this one we were fourth, really close to third, so that shows that our time and work is paying off,” Rolinger said. As a team, their method is to not be too extravagant on the course and to make smart moves. “It has been the same thing we have done since I have started coaching. We just really don’t try to be heroes on the golf course and take these incredible shots. We take the safe shot and take our time to read putts. We are very methodical, and it works,” Youngkent said. Throughout the season, the team has gotten closer because of the inside practices. 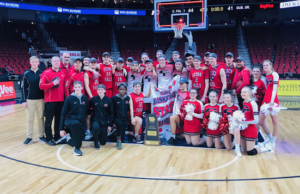 “I think that all of the little team meetings and talking about funny inside jokes that we have are what have made us close, and I think it is what makes this season so memorable,” Lytle said. Without the four “studs” that were on the women’s golf team last year gone, the team has had to build up its foundation again. “We are not the team that we were last year. We don’t have the same people and not necessarily the same scores, but we do have six girls on varsity that are willing to put in the time and work of what it takes to be a good player. That gives me hope that the season will turn into something really good,” Rolinger said. With a future of underclassman stepping up into varsity spots, all the team can focus on is what will happen this season and how it will execute its next meets on track to the state competition. “I am always excited for the future, but my focus right now is working with these girls and seeing what we can get out of this season. I think we have the ability of going to State, and I think they have the ability of going to State so my focus right now is to improve, and then go to Regionals and peak at State,” Youngkent said.